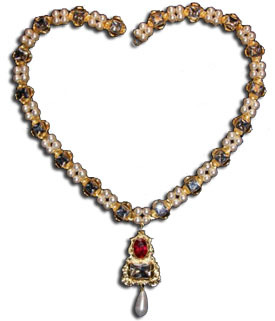 A reproduction of Jane Seymour's necklace as seen in the portrait by Holbein. This gold plated chain is extensively set with cubic zirconia and simulated pearls. From it is suspended a gold plated pendant. 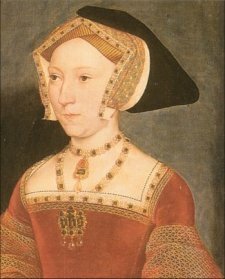 As shown in the Holbein portrait, this pendant is set with a large ruby red cabochon and a large cubic zirconium. The pendant measures 6cm tall. Please allow up to four weeks for delivery.